Winter has only just begun, yet we've had two snowstorms already. Like most dogs, my three love the snow. I don't know what it is about the cold flaky stuff that makes Lilah, Jasper and Tucker, well, flaky. Dogs who normally can't stand getting wet (that's you, Jasper and Tucker) romp around in the snow like it's the Best Thing Ever. A Gift From the Sky. And you can Eat It, too! Just an inch of white on the ground and my dogs turn into goofy puppies. And I love it. I turn in to a kid as well, watching my four-legged friends romp and jump and pounce and bound. Sometimes I just run around in the snow with them. And then we all come piling back in the warm house, happy and tired--and wet. Eventually, it all melts. And we're back to plain hard frozen ground--or worse yet, nasty thick mud that sticks to dog paws like Velcro. Until the next snow storm blankets our yard and we get to go out and do it again. The first storm of the season came in the fall--November 7. This year, The Weather Channel started naming winter storms, and this one was christened Athena. I'm sure our Athena felt she finally got her due. "Wait! What? A snowstorm named after me? Of course. As it should be." Tucker, Lilah and Jasper run through the snow as the storm just gets started. Too much snow on your back and you have to Floppity it off. By nighttime, we had more than six inches. The heavy wet snow covered everything with a soft white blanket, including our patio. 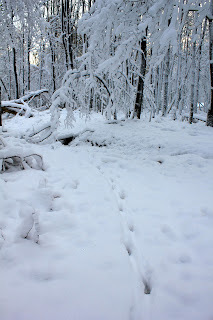 The next morning, a walk through the woods revealed nature's beauty at every turn. The heavy snow bent branches and trees already stressed from Hurricane Sandy's wrath a little over a week before, creating a new landscape--and in some cases breaking limbs that couldn't bear the weight. Morning sun shines through the trees after Snowstorm Athena. 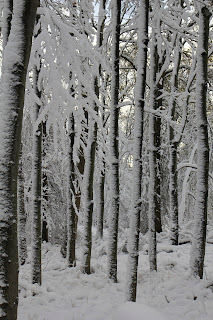 The wind blew snow against one side of the trees, streaking them with white. 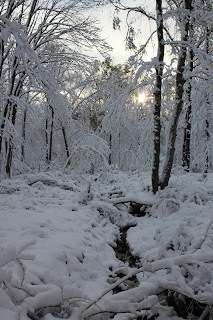 The jagged jumble of fallen limbs was softened by the covering of snow. I wasn't the only one walking in the woods after the storm. A deer had come through earlier. Heading back toward the gate and my home. Leaves were still on some of the trees. The front yard offered up its own beauty. And in the back yard, the dogs explored their territory.. The second storm, Snowstorm Freyr, came just a few days ago. It was colder, and the snow was dryer. Only three inches fell, but that was enough for doggy fun and games. With snow still falling, the dogs are ready to romp. Ooh! A sniff under the snow. All Noses report to duty. Once the dogs get started, they play in all combinations. Tucker and his Ball. Doesn't matter how frozen or snow covered it is, we eventually have to Play Ball. 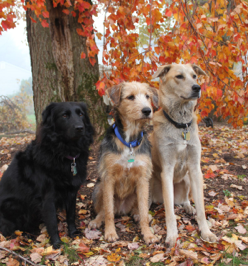 There are a few quiet moments, usually with one dog sitting it out while two others run around. It's at those moments that I like to try and capture a few Snow Portraits. Lilah, with a snowy snout. I love how the snow decorates her fur like fine sugar. Jasper, always looking regal, even as his fur is coated with snow. Tucker, showing off his Snow Beard, acquired from digging in drifts. And every once in a while, I capture something that just makes me smile. In the picture below, it wasn't until after I enlarged it on my laptop that I saw Tucker reflected in Jasper's eye. Cool. Through a dog's eye's: Tucker reflected in Jasper's eye. All of our cats are indoor kitties, though it doesn't stop them from watching us and wishing they could join in the fun. Though I would hazard a guess that one step into cold wet snow would have them turning around in a whisker's instant and heading back into a warm dry house. Calvin, Elsa Clair and a partly obscured Athena peer out the window at us. Once we head inside, we all play the Treats for the Feets game, where each dog gets a treat for getting his or her feet wiped. This also involves toweling off and removing snow clumps from furry paws. Of course all this activity requires Supervision by at least one of the cats. Tucker and Lilah waiting for their Feets to be dried. Elsa Clair Supervises. What IS this stuff? Calvin ponders snow brought inside and shaken off the dogs' fur. The Winter Games have just begun, and we're looking forward to the season. In the end, it took about six weeks...from kittens hidden away like fairy tale characters in their bathroom safe room, to full-fledged family members roaming amidst the friendly monsters/inhabitants who inhabit the world inside our home. In my last post, the kittens were spending time inside a pen I set up in our family room. And when the dogs were outside chasing squirrels in the back yard, I would let Elsa Clair and Calvin run around the house; this helped them become familiar with lots of kitty Hidey Places and escape routes. By this time, our two babies were such escape artists that there were daily close encounters with the dogs and cats as one or the other of the little fur balls flew over the gate when I opened the bathroom door. The dogs were mostly compuzzled; the cats were a little annoyed. But there was no meanness or chasing from the elder critters, and no fear from the kittens. It was time to let everyone mingle. Armed with a squirt bottle in one hand and some treats in my pocket to control dogs and cats, I allowed the kittens the run of the house--well, almost the run. Many of the bedroom doors were closed to restrict their access. Since the kittens knew their way around the rest of the rooms, it made it easy to follow them as they explored and played and kittied here and there. Dawn and Athena didn't really Like the kittens. Of course, they are Cats, and if it wasn't the Cat's Idea to get the kittens (and it was most certainly Not), then they don't like it. They registered their displeasure with hisses and glares, but eventually got used to the extra felines in the house. I fed them together, gave them all treats at the same time, and made sure to pet and give Scratchies to the elder cats whenever the kittens were around. This may have helped a bit. And while Their Highnesses would probably not willingly admit it, I think they're starting to like the little black and white Nuisances. I've seen Athena come bolting through the kitchen with Calvin hot on her tail. And when nobody is looking, late at night, Dawn and Elsa Clair sleep next to each other on a furry cloth at the top of the stairs. Dawn and Elsa Clair sharing a bed. Jasper looks a tad Worried. But that's Jasper's normal state. Feeding time is happy time. Usually, everyone is in the same positions. Athena and Dawn on either end, and the kittens in the center. Athena grooms Dawn, while Elsa Clair takes notes. Athena grabs a Secret Sniff of Elsa Clair. The Queen is in residence. A lowly kitten is Not Welcome. Athena jumped onto her bed only to discover it was occupied by Elsa Clair. Neither was giving up an inch. The Queen was Not Pleased. Calvin and Athena play Cat Inside the Box. In this case, the CIB was Dawn. A variation of CIB is Cat Inside the Drum. The kittens are fascinated. I think Dawn was having fun. Athena teaches Elsa Clair and Calvin the finer points of Helping put the groceries away. During Hurricane Sandy, we took refuge in the basement, where Athena served as referee during a competitive game of foosball between the kittens. Dawn demonstrates the Full Meatloaf position to Calvin. As for the dogs, the squirt bottle turned out to be mostly unnecessary. I think I only had to use it twice ...mostly a warning shot across someone's bow to make sure they weren't too aggressively nosey with the kittens. Because now that they had access, Jasper, Lilah and Tucker just wanted to Smell them. And by Smell them, I mean stick your nose as far into kitty fur as you can get and Inhale. Deeply. It's a wonder they didn't sniff the kittens right up their nostrils. The dogs could have broke their Sniffers with the amount of of snorting they attempted. Two dog noses trying to Sniff Elsa Clair. Jasper's head is about the same size as Elsa's entire body, but she doesn't seem to mind. Elsa Clair and Jasper nose to nose. Tucker is trying to figure out what could be so interesting about paper in a Box. Calvin is happy to show him. Jasper discovers a potential stowaway in Aaron's luggage. He promises Calvin he won't tell. Once they got their fill of Sniffs, then it was on to Licks. Actually, that was mostly Lilah. The kittens needed to be Cleaned. Really. She spent the good part of several days hanging around, trying to lick Someone. Didn't matter whether it was Elsa Clair or Calvin. She just want one Lick. Or maybe two. Her Dr. Lilah instincts were so strong, she just had to Lick a Kitten. For the most part, they would walk away from Lilah, or offer a tiny Leave Me Alone hiss. Until one day, she caught Elsa Clair in Sleepy Kitty Mode. That day surely ranks as one of the Top Five for Lilah. Lilah gets a Good Sniff of a sleepy Elsa Clair. Elsa is so comfortable with the dogs around that she just dozes off. And Lilah--Happy Happy Lilah--was able to just lay there and Sniff to her heart's content. Eventually, Calvin joined his sister in the cat bed. And patient, patient Lilah got to Lick Calvin's ears. It was a banner day. 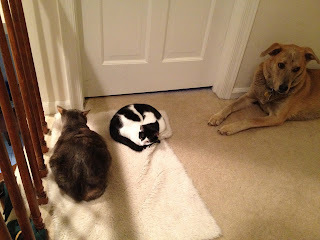 Today, four months after Elsa Clair and Calvin came to live with us, peace reigns in our home. Everyone gets along, for the most part, though sometimes there are differences of opinion as in any typical home. But usually those are quickly solved, with few issues. I think the only thing that has ever gotten hurt was Tucker's feelings after his Ball antics had irritated Athena one time too many and she swatted him just for walking by her. Tucker is Worried. Is that where kittens come from? He thought they were dust bunnies. Maybe they're Dust Kittens? We'd better keep the floors swept. The dogs may all run to look out the window, but the commotion is not enough to make Elsa Clair and Calvin leave their comfortable bed. Favorite Kitten Game: chase the dogs' leashes as we get ready to Go Outside. Lilah and Calvin are having some fun with Chase the Leash here. Typical daytime scene: Tucker, Calvin, Athena and Jasper share the couch. 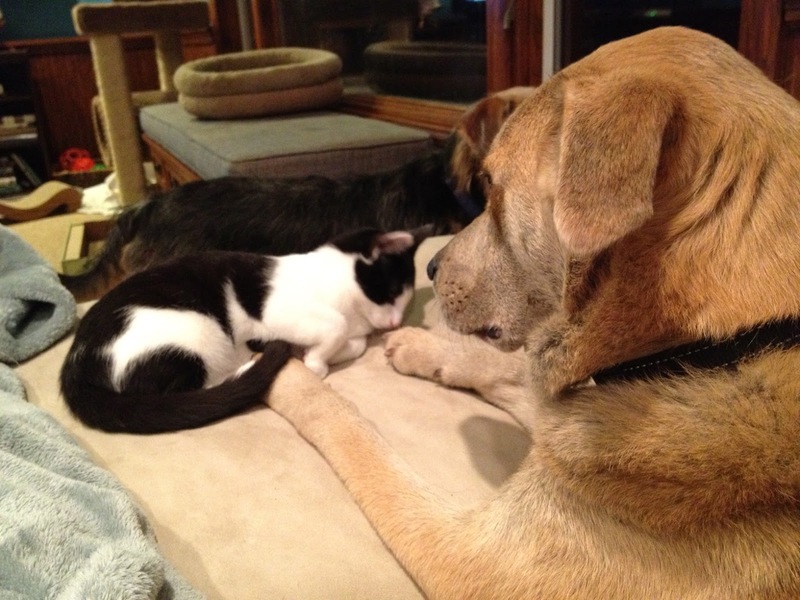 Typical nighttime scene: Jasper, Calvin and Lilah share the couch. "I got something on my foot." Calvin curled up on Jasper's foot and fell asleep. Jasper spent about 5 minutes worrying about it; he didn't want to wake up the sleeping kitty. Eventually, he slowly and gently slid his paw out from under him, without a murmur from Calvin.